Just How Good Was Barry Richards? As I get older I increasingly find that sporting memories have a tendency to become detached from reality. As an example I can still clearly remember being spellbound by a session of Test match cricket for the first time, as Derek Underwood spun England to victory against at Australia at the Oval in 1968. And then I remind myself that the Vietnam War was still seven years away from its conclusion, and that that conflict ended the best part of forty years ago, and suddenly I realise that Underwood’s legendary spell was delivered a very long time ago. In much the same vein I can vividly recall the treat that FA Cup Final day was in the 1970s, when it was the only club match that was ever shown live on television. The coverage lasted all day, and despite the fact that my team never got within a bull’s roar of the Final my brother and my father and I would still sit in front of the screen all day, our excitement building as the three o’clock kick off approached. 1976 is a very special memory – the final was between my brother’s team – for reasons I could never work out other than being a “fair weather” supporter he was a Manchester United fan – and my Dad’s team, little Southampton from the old Second Division. I can and do still replay in my mind at will the Saints winning goal, scored by the late Bobby Stokes. I will never forget the nationwide ripple of amazement that the upset caused, as well as the delight for my father and dismay for my brother – and the fortieth anniversary of that day is rapidly approaching, two decades after Stokes’ untimely death. Like Underwood’s spell at the Oval it was a couple of generations ago. But it doesn’t always work like that. As will be clear from my Cup Final day memories my Dad was a Hampshire man. In 1973 he decided we would make the short trip to Southport to watch his county play my team, Lancashire. Initially he had ignored my pleas to go to the game, but changed his mind after a first day which ended with the Red Rose all out for a modest 214, and Hampshire sitting pretty on 74-0. I have never enjoyed seeing Lancashire bested, but the prospect of watching Barry Richards and Gordon Greenidge continuing their partnership carried the day and I decided to go with him. The pair lifted the score to 200 before Richards, having comfortably outscored the powerful Greenidge, took one liberty too many with “Flat Jack” Simmons and was out for a glorious 128. Try as I might to put that day in perspective however I can’t – it still seems like yesterday – and in forty years I have never seen a batsman as good as Richards. Once or twice Brian Lara has come close, and occasionally I thought Martin Crowe might touch the same heights, but I know in my heart of hearts that I will never see Richards’ like again. Richards is the greatest of my time, if not by a distance then certainly without a doubt, but few seem to agree. “Am I out of step, or is everyone else?” is the sort of question we are supposed to ask ourselves as part of a catharsis when we have made mistakes, and I have been there with Barry Richards, but nothing ever changes my mind about him, and while I am not about to suggest he was a greater batsman than Sir Donald Bradman, nor necessarily even his equal, I cannot get the thought out of my head that, had he not been a victim of the circumstances that did blight his career, Richards might have earned the right to be mentioned in the same breath as “The Don”. Clearly that is an opinion I need to justify but I am not alone in holding it. As his career came to a close Tony Greig considered Richards to be the finest batsman in the world and expressed the view that in different circumstances I am convinced he could have rewritten the record books – and rewritten them with a style and grace matched by precious few players in the history of the game. And if that gives a clue to the way Richards batted John Arlott’s words he butchers bowling, hitting with a savage power the more impressive for being veiled by the certainty of his timing, are as good a summary as I have read. But before I look at those “circumstances” an account of Richard’s career is called for. It will come as no surprise that he was an outstanding schoolboy player and at 17 he captained a strong South African schools side that toured England. One fixture was against an invitational side who included Richie Benaud amongst their number. Richards raced to 33 before his first exposure to the wily Australian. The first delivery was a little short and Richards gleefully clubbed it to the mid-wicket boundary. The second was something Richards had not encountered before, a perfect flipper, and he was bowled playing for the spin that wasn’t there. Benaud had seen enough though, writing later even then it was quite clear that he was a player out of the ordinary. Richards’ first innings in First Class cricket came a couple of years later, for a South African Colts XI against Mike Smith’s 1964/65 MCC tourists. He began with 63, taking just 56 deliveries to reach his fifty before, as he was to do so often over his career, he took one liberty too many and was stumped. Charles Fortune, in his book of the tour, described Richards’ as having played with a confidence that was not far short of contempt. That innings, together with a further promising outing against the tourists for Natal, was enough to get Richards into the Test trial a couple of weeks later but, unfortunately, he did not grasp the opportunity sufficiently firmly and the 18 year old failed to get into either the Test side or the party that came to England in 1965 for a three Test series. That said Gloucestershire off spinner David Allen had seen enough of Richards and his great friend Mike Procter to persuade both to spend the 1965 summer with the county. In the days before the immediate registration of overseas players was possible the two young South Africans only played one First Class match, ironically enough against their countrymen. Sadly rain only permitted play on the first day, but it was enough for the two to make a great impression. Procter scored 69 and Richards 59. Wisden described both as driving, cutting and pulling with power, style and precision, as they added 116 together at well over a run a minute. Australia visited the Cape in 1966/67 for a five Test series. Selected to play against the tourists for a South African XI three weeks before the first Test Richards chose the perfect time to make his maiden century, and then in a moment of madness cost himself his chance of a Test debut during an incident at a hotel where, after being refused admittance, he lost his temper and caused a small amount of damage. One of the selectors headed off any possible police involvement by making peace with the hotel management, but demotion to number eight in the second innings made the selectors thoughts clear, although by making Richards twelfth man for the final Test there was at least a positive end to what had ultimately been a disappointing season. The following year Richards recorded four more centuries and, with the English authorities opening up the county game in 1968, he had offers from Hampshire and Sussex. He chose the former and scored more runs than anyone else in the country, 2,395, although a poor conversation rate, only 5 of his 23 half centuries converted into three figure innings, hinted at a disinclination to concentrate too hard for too long. Only Geoffrey Boycott headed him in the First Class averages. He was chosen as one of Wisden’s “Five Cricketers of the Year”, the good book commenting Richards’ horizons seem limitless, and it will be fascinating to see how far his talents will take him. In January 1970 Australia arrived in South Africa for a four Test series. They were to prove the only Tests Richards ever played, and his country’s last for more than two decades. A certainty to be selected Richards attitude to his debut was summed up by Procter, who later wrote of his great friend I had never seen him so nervous. Further confirmation of the importance of the occasion to the young Richards comes from the fact that it took him 20 minutes to get off the mark. He ended up with 29 and 32 in the first of his team’s four comprehensive victories. The nerves thereby banished his five other visits to the crease in the series brought him two centuries and two half centuries, and a final tally of 508 runs at 72.57. In the second Test a hundred before lunch on the opening day was his for the taking, but he decided to forego that particular landmark for the good of the team, and played out a maiden over just before the interval. He wrote later that had he known then how his Test career would pan out that he would have made the effort to join the elite band of Victor Trumper, Bradman and Charles Macartney. Later that year Richards had expected to be playing Tests in England, but due to the success of the “Stop the ’70 Tour” campaign he ended up playing five “Tests” for the Rest of the World. He played a series of cameos, and wrote later the contests never had the authentic atmosphere of a country versus country conflict. On our side there was a very free and easy approach. And so Richards’ life settled into a routine of County Championship cricket in the English summer followed by winters back at home in South Africa. He has a fine record in England, but did not much enjoy himself. In his 1978 autobiography he titled the relevant chapter Summers of Discontent and wrote I felt like a prisoner within the system …. the routine is interminable; every match is a carbon copy of the last. The daily grind bored him, as did the reaction to his batting. He became frustrated at the expectations of supporters who seemed to be satisfied with nothing less than a two hour century each time he went to the wicket. They were disappointed if he failed, and if he succeeded looked on his achievement as nothing more than their entitlement. It follows that Richards often found it difficult to motivate himself but, as John Arlott observed;Face him with a challenge and he will rise to it. Then he plays himself in with clinical care, gradually unfolding his strokes until they flower all around the wicket. Television cameras would often bring out the best in him, as did games against touring sides. Interestingly his average for Hampshire overall was 50.50, but in those games in which Richards faced teams representing their country it rose by half, to 75.88. Against the 1975 Australians he scored 96 and then retired hurt with 69 in the second innings. He was particularly harsh on Jeff Thomson, fresh from his terrorising of England’s batsmen the previous winter, whose match figures were 0-143. It is difficult for those of us who would give our eye teeth to play just a single First Class cricket match, let alone earn our living from the game, to appreciate how the attraction of county cricket could have palled as much as it so clearly did, but those gifted in other fields of sporting endeavour understand. Another favourite son of Hampshire, Southampton and England footballer Mick Channon, certainly sympathised writing in Richards’ benefit brochure in 1977 that I know that the worst day of my life will be when an England squad is picked and I am not in it. That’s how much playing international football means to me. So I really sympathise with Barry Richards. It must be shatteringly disappointing and it is a horrible position in which he finds himself. Richards was one of the first to sign for Kerry Packer’s World Series Cricket in 1977. After seven long years without an international challenge playing for the WSC World XI over the next two seasons clearly meant a great deal more to him than the relaxing jolly that the not dissimilar series in England in 1970 had been. He expressed regret that the opportunity had not come earlier in his career, but stressed his desire to play again in the cauldron of international cricket. In his five Supertests he scored 554 runs at 79.14. The 1977 English season was Richards’ benefit year, and in those days the GBP21,255 raised was a tidy sum. It is not unusual, as happened to Richards, that his form suffered in his benefit year, but even if he did, for the only time in his career with Hampshire, fail to reach the thousand run mark in a full season, an average of 42 was still respectable. It was however the beginning of the end. At the start of the 1978 season the county fined Richards for remarks he had made in a radio interview criticising the treatment of Tony Greig, who had been banned for eight weeks by the TCCB after an article had appeared in his name in a newspaper that had contained some harsh words about Geoffrey Boycott. In light of what happened a few weeks later the experience clearly soured the relationship. In his autobiography Richards had written Whenever I walk off a county ground for the last time – whenever that will be – it will be with an enormous sense of relief. The end came sooner than he thought when, after the match against Leicestershire at the end of June, he called time on his County Championship career. He said he would still play some one day games, and did so but the disenchantment was mutual, and he didn’t play again after Hampshire were knocked out of the Gillette Cup a month later. It was not remotely like the way he should have bowed out. At 33 the finest batsman of his generation was gone. For a while he left the game completely but, at 36 he was lured back by the prospect of playing against the rebel English, Sri Lankan and West Indian tourists who visited South Africa in 1981/82 and 1982/83. He wasn’t quite the batsman he had been of course, but he was still a fine player. And so to return to the comparison with Bradman. It is not without relevance to quote the great man himself on the subject of Richards; You could never tire of watching him ….. it was a privilege to see him play. The Don also had no hesitation in declaring that Richards was the best right-handed opening batsman he had seen. Perhaps he did not want to make a comparison with the left-handed Arthur Morris, who was Richards’ opening partner in his dream eleven, but he clearly ranked him above Len Hutton and Sir Jack Hobbs. The Master was past his best by the time Bradman encountered him, but he saw the best of Hutton. That Bradman had advantages that Richards did not must be the case. For half of Bradman’s career he could not be out lbw to a delivery that pitched outside the off stump. Richards always could, and indeed for most of his time a delivery that did not strike him in line either, although that is perhaps a minor point – Barry Richards was not in the habit of not playing a shot in those circumstances. On another legal issue Bradman had uncovered wickets to contend with, although so did Richards for part of his career, and he also played much more of his cricket on the soft English wickets of the 1970s rather than the rock hard Australian shirtfronts that Bradman enjoyed in the 1930s. There was never an issue for Bradman of the sort of drudgery that Richards had to bear with the seven days a week cricket he had to play. It is true that Bradman did tour England four times, and that in those days tours were long and drawn out affairs over a full season, but they only happened once every four years, and unlike Richards Bradman did not find his name on the team sheet in every match. The Don never played more than 36 First Class innings in an English season. In 1968 Richards totalled 55. By 1977 that figure was down to 25, but then he missed six matches through injury, and had 18 List A innings as well. So Richards’ workload was much higher. It hardly needs to be said that there was an enormous difference in what motivated both men. Throughout his Test career Bradman enjoyed what Richards craved, playing for his country. For Bradman there was, for much of the time, the captaincy of Australia as well. The Australian public has always cared passionately about its sport, and at no time more so than in the aftermath of the depression when, looking back at some books written by men who played the game in that era, it would not be much of an exaggeration to say that Bradman carried the hopes and dreams of the nation on his shoulders. After their hero returned to the fray after missing the first Test of the Bodyline series the crowd at the MCG in late December 1932 taunted the England fielders from the off with shouts of wait till our Don comes in. They were silenced briefly when Bill Bowes bowled him first up, but were back in good voice in the second innings when Bradman’s century was the major contribution to what proved to be Australia’s only success in the series. For them Bradman was the very embodiment of Australia. As Bradman’s record proves he thrived under pressure, and Richards was the same – how many more runs would Richards have scored if he had borne the same pressures, and cared as passionately about his innings as Bradman did? There is another major difference between the two men’s careers. Richards was not always popular, either with teammates, opponents or the public, and his autobiography clearly demonstrates how that rankled with him. That he has mellowed over the years is clear from the way that he talks about the game now, but these experiences would inevitably have demotivated him at times. At Hampshire there were some seasoned pros amongst the squad who resented a 22 year old who was earning considerably more than they were, and there were also wider concerns amongst English players about the sudden influx of overseas players taking so much money out of the county game. Richards did not help himself when interviewed before the start of the 1968 season when he declared that he would score 2,000 runs. He was reminded of that promise by the Sussex fielders as he made his way back to the pavilion after John Snow castled him for a duck in his first innings of the campaign, and there were those amongst his own side who were less than sympathetic, although of course come the end of the summer he had made good on his promise. The situation was not dissimilar in Australia in 1970/71, where overseas imports for the domestic First Class game were rare. And that move was unpopular in South Africa as well, where the press portrayed Richards as a mercenary, who would always chase the money. The truth was that Richards told Natal what was proposed, but the province made no counter offer, so again much of what was said was unfounded and unfair. Whilst in some ways criticism and unpopularity would have, and clearly on occasions did, spur Richards on, the overall effect must have been to suppress his appetite for runs, at least to some extent. Back in the 1930s Bradman was not universally popular amongst his teammates, O’Reilly and Fingleton in particular not being wholly enamoured of him, but he enjoyed the wholehearted support of the Australian public throughout his remarkable career, and whilst not all of his teammates may have enjoyed the Don’s company, he had their unswerving support on the field of play, and as noted for a large part of his career he had the captaincy to further inspire him. To my mind there is no doubt that the circumstances in which Bradman played out his career were infinitely more conducive to a supreme talent maximising his potential than those which prevailed for Richards. That begs the question I mentioned earlier – had Richards had the advantages Bradman had would he have been as successful as the great Australian? I wouldn’t necessarily go that far, mainly because I believe that Richards would always have been more of a risk taker, but I don’t think there would have been too much splitting them, and that the great debate would not be as to the identity of the second greatest batsman of all time, but the third. When Richards made that 320 in a day, he played and missed at his first ball from Lillee and Rod Marsh said loudly “I thought this bloke was supposed to be able to bat”. Lillee bowled the last ball of the day to him, and he apparently one-two-oned down the pitch and hit him over the sight screen to end the days play, whereupon the first slip looked at Marsh and said “Rod, I think he can bat a bit”. I remember Richards’ calling time on his county (championship) career and the bitterness that surrounded him at the time. I recall him saying that he was tired and bored with the same old routine and so on. The opinions, which lead to the disciplinary measures taken against him for his criticism of Boycott, were petty and did him (Richards) no credit at all. Political matters did indeed deprive him, and others of course, the opportunity to compete with the best but he became so bitter that I lost respect for him. After all he still had a good life and made a good living from the game and I don’t remember Barlow or Proctor, for example, whinging to the same extent. Richards suffered a deep private tragedy a few years ago but the only person he feels sorry for is himself. BTW Bobby Stokes was offside. Why have you got a slip in the last over of the day when the opener is 320 not, the real question. Yeah. Changed to what it is now in 1937. Can’t add much than what I already have in the other threads, and that Martin hasn’t addressed, but something in the article caught my eye – Bradman saying that “you could watch him all day and not get bored”. I want to elaborate on my take on this. For me, the “not being bored and watch him all day” aspect of batting has been very important, and perhaps that is my fascination with Barry Richards as well. But there is a caveat. Presumably, Gilchrist’s batting will also provide the very same aspect. The difference is that Richards gave you the experience with an impeccable, beautiful and elegant attacking technique. A lot of times during a Gilchrist innings, you would cringe at the technique, or/and shot selection etc. Not so with Richards. It was a complete experience watching him bat. The same was true of Tendulkar during the years 1996-2003. I haven’t seen Sobers, but from the things that are said, he seemed a similar kind. Well I did see a bit of Sobers, but not enough, and those were certainly not his best days. I never cringed at Gilchrist. Beautiful stroke player. 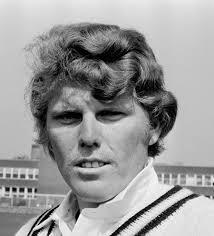 Great piece on the great Barry Richards. While it was a shame he was deprived of a test career or somewhat plans I’m comparison to what the citizens and political prisons were subjected to. There were no winners from that period. Regarding his greatness, he was the best batsman in the world between Sobers retirement and the other Richards emergence and by all account was the equal of both. Can’t get much better than that. When Gilchrist batted it was pretty obvious that the bowling was getting hammered. Viv Richards and Sehwag were none too subtle either when they began to pulverise the bowling. On the other hand, players like Barry Richards or David Gower tended to dominate without getting violent. I think that was the point that Harsh was trying to make. After all, Gilchrist was one of the cleanest hitters I’ve seen. Fabulous piece as usual, Martin. Out of curiosity, since you mention Crowe and Lare here, how does the Antiguan Richards stand in your pecking order? Must have been good. Never saw him in his prime, and only time I saw him play was in a Master’s cup somewhere in early 90s. He and G.Pollock both looked very aggressive against pacers, but spinners did pretty well against them. Can’t get much information from such a tournament because they must have been 15 years past their prime by then. Although I believe that as almost as every SAF batsman we see, he also would have been less proficient against spin, especially on helpful conditions. There were definitely winners. Probably not the people you want to be winners though. He coached South Australia for a while when he was pretty old. Apparently after a net session he’d occasionally go in and face the quicks, and everyone there said he would have been the best player in the team still. My father started following cricket in the 1920;s and saw the likes of Bradman, McCabe, Hobbs and Hutton. He rated Richards as good as anyone he\’d seen play. For myself I have yet to see anyone better. I had the privilege to watch Barry Richards bat on many occasions (when Barry played in South Africa during the late 1960’s and during the 1970’s). I have never seen a better batman ever since. He had so much time to play his perfectly timed shots. On many occasions he tossed his wicket after scoring a ton due to the fact that he became bored of the bowling. If Barry had the opportunity to play lots of international cricket, he would have smashed just about every batting record in the book. I saw every home game Natal played from 1971 -1975.Currie Cup cricket had the intensity of test cricket and Barry’s wicket was the prize.he was unbelievable in those years and would give his wicket away after scoring a hundred.he was in my opinion the greatest batsman of all time. I can honestly say that nothing was more exciting or absorbing for me as a schoolboy growing up in England than watching Barry Richards bat or Illie Nastase at Wimbledon. In the depths of time, as a young bloke, I was lucky enough to watch Richards bat. SCG, World Series. A low scoring game he scored 100* to win it. I also watched him score 200 odd on TV. Apparently, he reckoned he was past his best at that time. He must have been a helluva player in his prime then, because if there has been a better batter, I’ve not seen him (and I’ve seen a few). He had so much time to play, and played so very, very late. Barry Richards as stated by many better judges than myself was easily the best batsman between 1970 and 76 when he would share that status with ViV Richards for couple years , As Christopher Martin Jenkins remarked, It’s not so much the achievements that places Barry way way ahead of those around him but the ease and in which he makes his runs which makes him nothing short of a Genius, Dickie Bird ,Sir Donald Bradman Jeff Thomson each echoed those sentiments , and there you have four great judges seeing it from in the middle . Personally speaking , to see Barry and Gorden Greenidge opening for the county and the score less than 62 and Barry has his fifty already sums it up for me and the 207 in WSC was a master class even outscoring the then Master Vivian by more than 70%.. without a doubt the best since 1970, I don’t believe even Barry knew how good he was..and nobody will ever know. I have been a Hampshire member since 1973 and am priveliged to have seen Barry Richards and Gordon greenidge opening for Hampshire many times. My view is that Barry Richards was the best batsman of that generation .whether he was the best of other generations is for others to decide,but l rather suspect that he was.. I also witnessed his innings against the 1975 Australians ,what other contributors have failed to mention is that his 96 was scored before lunch,an innings that for me still lives in the memory. I can also recall on many occasions spectators leaving the ground once he had been dismissed,they had come to witness him batting and once he was out the rest that followed did not quite have the same appeal. Thanks for the memories Barry .the best l have seen. As a teenager, I was a junior member at Hampshire for 3 years 74-76, I saw the innings against Australia, but what I considered to be an even better innings was scored against Glamorgan in the Gillette Cup 60 over competition. Hampshire had won the toss and decided to bat, after an hour or so Gordon Greenidge had scored fifty plus and Barry had struggled against a swinging ball to about 25. Barry then clipped a ball off his pads through square leg – at lunch he had scored 108 and GG had 74. Barry was caught on the boundary for 129 attempting to hit his third 6 of the over off the ninth ball after lunch. Gordon went on to score 174? which was a competion record at the time (no fielding restrictions), which if I remember included 13 sixes, one of which went through the roof tiles of the pavillion and another which went over the pavillion and had to be retrieved from the houses on the opposite side of Northlands Road. The reason I remember this is that it was the only time that my Dad managed to get time off work and we went together. My only regret is that I wasn’t old enough to go for a drink with him afterwards – He was a Police officer so it would have been a bit difficult! ! Two great players – contrasting styles – but watching them was the difference between Mozart and Heavy metal, and as much as I appreciate Sabbath, Deep Purple et al, Mozart you can listen to whatever mood your’re in. The only players I can think of that come close in style are Mark Waugh, VVS Laxman and Michael Vaughan, and none of them have a carrer record anywhere close to Barry’s. Hi, just a short comment. I was a Hampshire lad and considered Richards to be the finest batsman I have ever seen. I used to watch Hampshire a lot in the 60’sand 70’s . You either got Andy Roberts bowling or Richards and Greenidge batting. Watching Richards dismantle an attack was a spine tingling experience the like of which I’ve never had before or since. Greenidge was good but Richards was a genius. We all watched in awe as he hit shots no one else could contemplate and were disappointed when he was out. Then many would leave because… how could you better that . Barry Richards was certainly as great as he is made out to be in the article and the comments. I have no doubt about it. What very few ever acknowledge and the world at large did not see enough of, was that Graeme Pollock was at least as good, if not better. Richards was undeniably unbelievably good. So too Pollock – from an earlier age and for a longer period of time (career) than Barry. Regardless of how highly they are both regarded, my contention is that they are both constantly under-appreciated. Ultimately, I would claim that Pollock was the best batsman in the world between 1967 and 1978 and, having seen both bat, that Pollock was the more naturally talented than Richards.